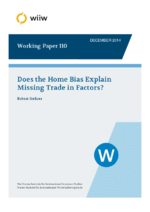 Does the Home Bias Explain Missing Trade in Factors? It is now widely accepted that when controlling for international differences in production techniques, the predictions from the Heckscher-Ohlin-Vanek (HOV) theorem are largely satisfied. However, a large amount of ‘missing trade’ remains. This paper makes two main contributions: Firstly, the HOV is tested for various production factors including labour by educational attainment levels (high, medium, low) and capital. Secondly, the paper allows for a more general structure of final consumption in the HOV framework with technology differences, which reduces the amount of missing trade. We test for the effects of non-homothetic preferences, home bias of consumption and the role of distance at the country and industry level. We discuss how this can be tackled in the analytical framework both for a country’s total exports but also in a bilateral way. Results are shown both for total trade and bilateral trade. Empirically we draw on the recently released World Input-Output Database (WIOD) and show the extent of reductions in ‘missing trade’ caused by the various assumptions and restrictions on demand structures.